(CBS) Has McDonald's blinked? After enduring years of criticism over the high fat and calorie content of its popular Happy Meal, the fast-food chain says it will revamp the meal, cutting back on the fries and adding apple slices. "What we're doing is offering fruit to every child that comes into a McDonald's, so it is an automatic," Jan Fields, the company's president, said Tuesday in an appearance on Good Morning America. "We recognize the importance of fruit in a child's diet." McDonald's will reduce the amount of fries in each Happy Meal from 2.4 to 1.1 ounces and add a quarter-cup of apple slices. Consumers may also get pineapple or orange slices, raisins, and carrots, depending on the time of year. 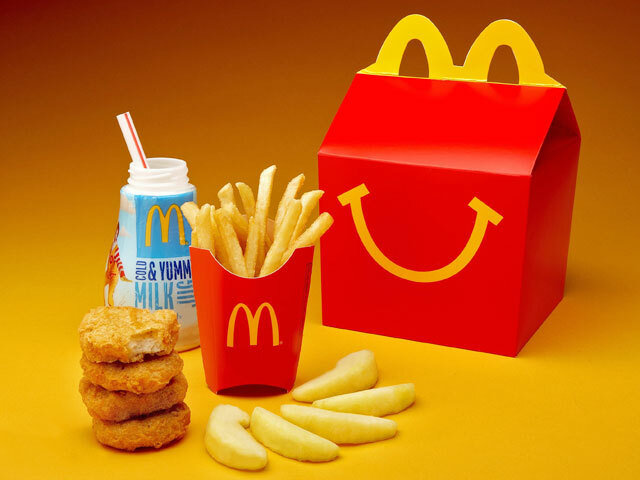 Previously, McDonald's had offered kids' meal customers a choice between fries and apples with caramel dipping sauce. The revamped meals won't have any dip. Although it might not sound like much, replacing some fries with fruits can trim over 100 calories from a Happy Meal. For example, a hamburger meal that used to contain 590 calories will dip to 470 calories - measurements that factor in a kid will order the default soda instead of other options the company is introducing, like fat-free chocolate milk. Kids can also opt for more fruit instead of the fries. Some experts applaud the changes. "These types of incremental improvements in popular meals can have a broad impact on public health," Dr. Adam Drewnowski, director of the center for obesity research at the University of Washington, said in a written statement. "Better to improve the diets of many than to seek perfection for the few." But Dr. Marion Nestle, professor of nutrition, food studies, and public health at New York University, is dubious. "It's a step - a tiny step in the right direction," she told CBS News. "I don't happen to think that potatoes are poison, and I think it's great they're giving out fewer of them because they're fried. But what I'm hoping for is a default Happy Meal where everything that's in it parents don't have to worry about." She said research shows that people tend to order the default option, so removing soda - which adds "no nutritional value" - would be an even bigger step. Adding more fruit wouldn't hurt either. "Why not half a cup, is that asking too much?" Most important, she said, the culture surrounding fast food and how its marketed needs to be changed. "It teaches you that this is what's normal food, and it's not."